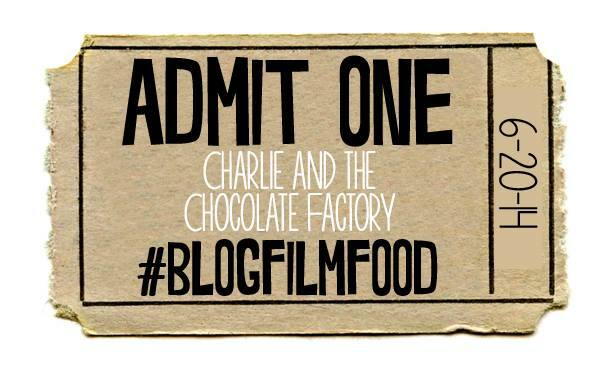 Welcome to the third installment of #BlogFilmFood, a digital dinner and a movie. Though this month, it’s all dessert with Willy Wonka & the Chocolate Factory. Or, if you’re insane enough to prefer it, Charlie and the Chocolate Factory with Johnny Depp. 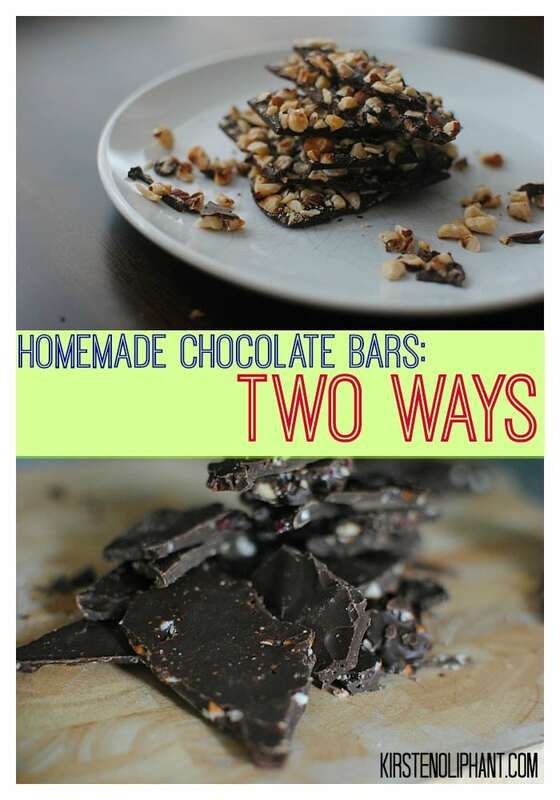 Keep reading for two simple recipes for your own homemade chocolate bars! Plus, there is a GIVEAWAY at the end, so don’t miss it! As a child and an adult, I feel there is something both wonderful and terrifying about Willy Wonka and the Chocolate Factory. On the one hand: chocolate rivers! Edible candy plants! Fizzy lifting drinks! On the other hand: Tiny orange men singing patronizing didactic songs! Creepy strange men who look like the nazis from Indiana Jones whispering in the ears of children! Your worst childhood faults resulting in a bizarre punishment and/or death! A man who looks like Richard Simmons sing-songing life lessons at you while secretly testing your moral character! Now that you’re all terrified, let’s talk about easy homemade chocolate bars! 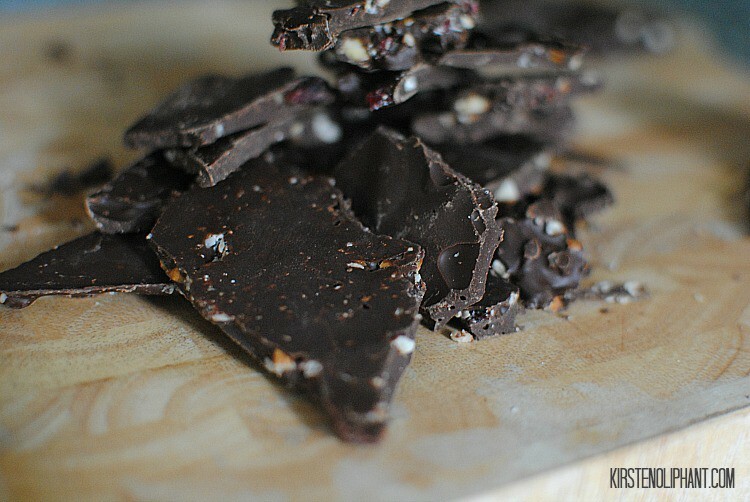 To be fair and balanced, these bars look more like homemade chocolate bark, but they are every bit as tasty as the geometrically perfect bars you might find in the store. Who needs a rectangle anyway? I always preferred a rhombus. Wait—is a rhombus a type of rectangle? Back to the main event: homemade chocolate bars. You can make these any old way with any old thing, so let me give you the basic recipe. Melt chocolate of your choice, dark or milk. (The overall taste will depend on the quality of chocolate you use.) I will always prefer dark. I also never use a double broiler. I have NEVER used a double broiler. And you KNOW I burn stuff all the time, so if I can do without, so can you. 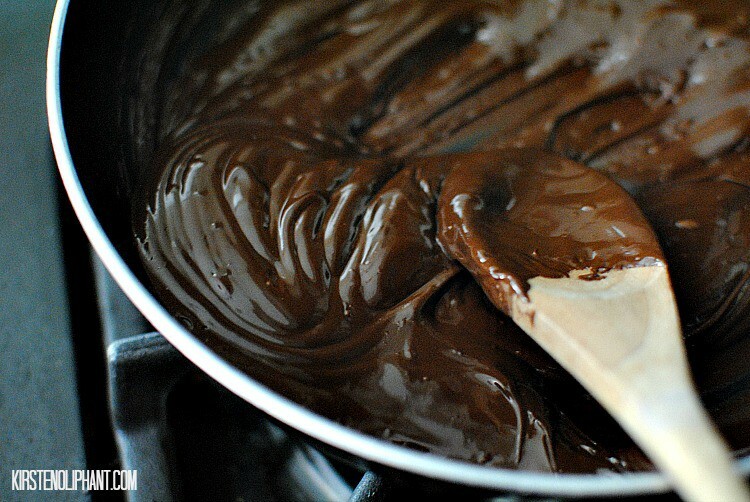 Melt chocolate (I used chocolate chips) and spread out over wax paper with ingredients of your choice. Place in fridge to harden and once hardened, break up into pieces. Ta DA! These are so easy, they should go in my Stupid Simple category. My first batch was hazelnut because…wait, do I NEED a because? Think Nutella. 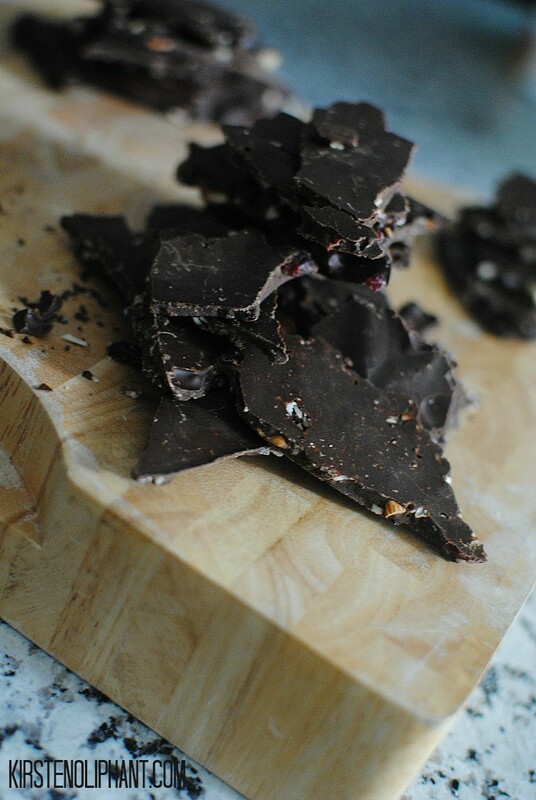 Crushed up hazelnuts plus dark chocolate is just divine. A little sea salt is totally necessary with this for a bit of a zing. I’m not going to say that I forgot the salt and used a hairdryer to melt the chocolate enough to add the salt, but I’m not saying I DIDN’T break out a hair dryer to do it. Ps- If you forget sea salt and want to add it, you can totally bust out a hair dryer and just get the top a little melty, then sprinkle with salt. NOT THAT I’VE TRIED IT. Batch #2 derived its inspiration from my time in England where I was always being surprised by fruit in things. It seemed like every other item in the grocery store had black currants in it. I don’t know what black currants are, but they remind me of raisins. Why would one put something like a raisin in chocolate? This is my normal thinking. But Cadbury has some kind of Fruit and Nut Bar that is surprisingly good, black currants and all. 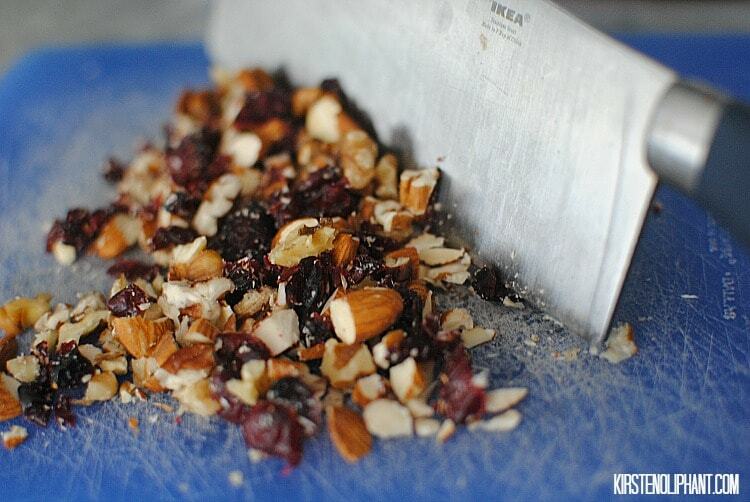 I chopped up pecans, almonds, walnuts, and dried cranberries. I spread the chopped mix on the wax paper, then poured the chocolate over top and spread it out before putting it in the fridge. I got too tired and overrun by small children or I would have had a third batch with coffee beans. Chocolate and coffee—why did I not make this first? Next time, friends, next time. But with such an easy (and delicious) recipe, believe you me, it won’t be long. And there are no scary orange men to sing terrifying songs while you’re eating. Take that, Willy Wonka! Speaking of taking that, who wants to take home copies of the new AND old version of Willy Wonka? Enter for a chance to win both! Now is the time where you hop all around to see the other fabulous recipes inspired by Willy Wonka! Hint: there is very little savory about this month’s recipes. one of the things i detest about hollywood is that they do remakes of iconic films. why would you redo this, like doing GONE WITH THE WIND or SOUND OF MUSIC or CASABLANCA again, OK, a little overboard here but you get my drift. i loved my father’s day container of these chocolate tasties and know that Willy would approve. I definitely prefer the original; Gene Wilder is a genius! Oh, man, those bars sound delish, especially coffee bean! Would you toast the beans first, or do some other type of extra roasting to make them a bit easier to eat? It’s been a while since I’ve eaten a bean whole, don’t remember how crunchy or hard they are. I love the idea of using cookie cutters to try to corral the chocolate into a particular shape. Not sure if silicone or metal cutters would be better as molds. I would probably crush them up so they aren’t quite like coffee grounds, but smaller than a bean. A pulse or two on a grinder, maybe? I’ve tried that before and it was fabulous. Just the right amount of coffee to chocolate!